The original shape of this luminaire is composed of two metal branches overhung by two cream-coloured lampshades. 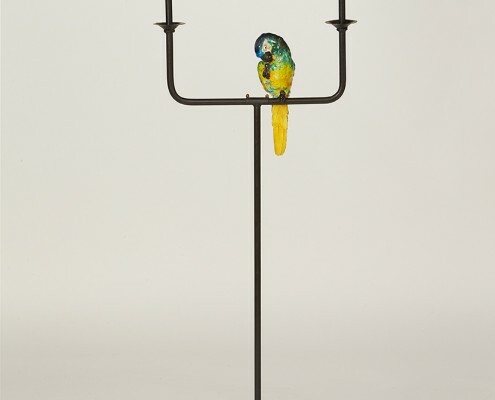 The originality and specificity of this luminaire is the presence of a green, blue and yellow parrot scratching its coat with its beak, installed on the horizontal metal bar. If this piece is first of all utilitarian, it is especially an element of decoration. 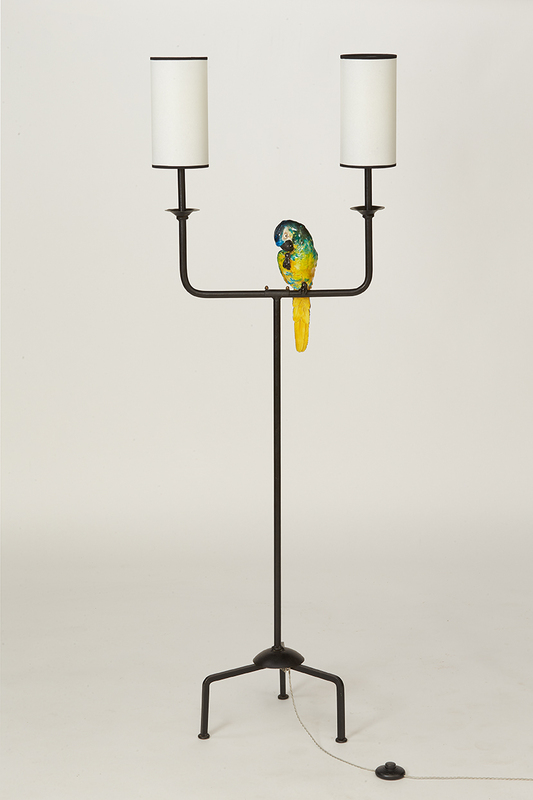 The parrot is a motif often used in decorative arts, because it carries several senses. Indeed, the parrot is a popular motif for its colours and for the exoticism it conveys. As early as the 17th century, Flemish artists were interested in these large birds in the image of Pieter Bol. The fascination for parrots continued in the 19th century with the paintings of Courbet and Manet, which associated the animal with seductive female figures. The parrot, imported from Asia or America, became a much sought-after pet and several members of the bourgeoisie or aristocracy owned aviaries furnished with these rare birds. In the decorative arts, the parrot motif is highly appreciated for its decorative qualities and for its kinship with Japonisme.